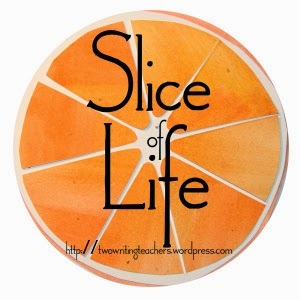 Pleasures from the Page: Slice of Life: Thank you, Danielle! Slice of Life: Thank you, Danielle! We've all been there, at the intersection of technology and frustration. Today it occurred as I tried to register for this fall's Poetry Camp at Western Washington University. For some reason, when I tried to register, the site indicated I had previously used the system. That's when I remembered that last winter I had attended the WWU Literature Conference. I used the "forgot my user name button", and my user name was emailed to me. But then when I entered it, it was unrecognized. After several rounds of circular hell, I resorted to calling the number listed on the registration page. That individual is out of town until June 29 (the day I fly home), and June 30 is the early bird registration deadline. Afraid that I might get busy and forget to register, I resorted to trying another number at the university. This individual promptly told me that she could connect me to the aforementioned individual (who is out of town until Thursday). When I mentioned my problem in greater detail, she connected me to an IT person who was unable to help me. However, this person managed to pass my call on to Danielle who solved the problem. It turns out that my earlier registration was by paper, and even though the system thought I had a user name, I didn't. Danielle arranged to give me a user name and password and SUCCESS! I'm registered. Danielle is my heroine of the day! My goodness, what a lot of back and forthing until you achieved your aim, Ramona. This sounds like a wonderful event - made for you! I'm so glad you got in! Our technology a blessing and a curse. Persistence pays off! I understand your aggravation! I've been there too. Fortunately you got this taken care of and now you have an event with poetry to look forward to in October. I just had a similar problem with one of my investment sites. Turns out I was trying to enter the wrong site. No one told me until I called. Yikes, it's a mystery sometimes. Glad you made it in! TECHNOLOGY IS LIKE THE ADAGE ABOUT THE CHILD - WHEN SHE IS BAD, SHE IS VERY BAD AND WHEN SHE IS GOOD, SHE IS EXCELLENT. Oh, Ramona, I have been in the middle of tech issues. They are so frustrating. I am glad your tech nightmare was solved. Yep, I've been there Ramona, and I wasted time before I broke down and reached out for help. Sure, I love it when I can get to the answer on my own, but when it gets obvious that I'm wasting my time... then give it up :) right? Poetry Camp sounds like so much fun! Technology can be soooo frustrating! So happy for you that Danielle straightened everything out and that you're going to Poetry Camp! I'm so jealous! I'm so glad the registration all worked out - thanks to Danielle! Celebrate This Week: A Homecoming and a Wedding! Stacks and Files and Piles of Poems! Poetry Friday: Tod Marshall Visits IMS!